1. Preheat oven to 350 degrees F. Beat together butter and sugars until creamy. Add eggs, vanilla, and orange extract; beat well. 2. Add combined flour, baking soda, and salt; mix well. Stir in coconut and pineapple. 3. Drop by rounded Tablespoonful’s onto parchment-paper lined cookie sheet. 4. 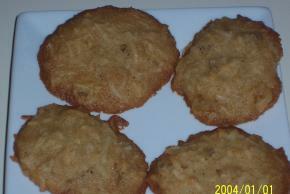 Bake 10 minutes; they will be golden brown on the edges. Let cool and set up. Enjoy!